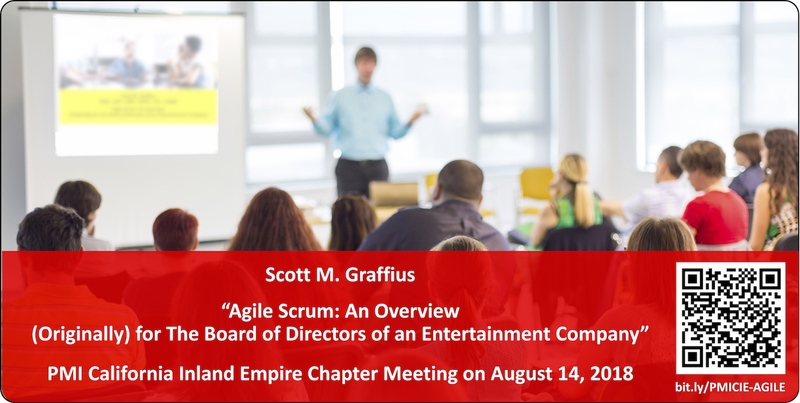 Scott M. Graffius will deliver a talk—“Agile Scrum: An Overview (Originally) for The Board of Directors of an Entertainment Company”—at a public meeting of the Project Management Institute California Inland Empire (PMICIE) Chapter on August 14, 2018. For more information, and to register for the event, visit here. Agile Scrum won first place in the Business category at the 2018 International Pacific Book Awards. A press release from Scott M. Graffius, the author of the book, is located here. Additionally, the text from the release is presented below. Los Angeles, CA — Agile Scrum: Your Quick Start Guide with Step-by-Step Instructions (Scott M. Graffius, author; Chris Hare and Colin Giffen, technical editors) won first place in the Business category of the 2018 International Pacific Book Awards. The annual program is sponsored by Pacific Book Review—a literary review outlet, and a member of the National Book Critics Circle and the National Education Association. The competition was open to English-language books in print, e-book, and audiobook formats worldwide. The judging panel included professionals with expertise in the categories over which they presided, as well as experts from the fields of editing, reviewing, and publishing. Books were evaluated on innovation, originality, and readability. Results will be announced to booksellers, publishers, public and academic librarians, wholesalers, distributors, and agents through the sponsor's site, Publishers Weekly, and additional outlets. There are a variety of frameworks supporting the development of products, and most approaches fall into one of two broad categories: traditional or agile. Traditional practices engage sequential development, while agile models involve iterative and incremental deliverables. Organizations are increasingly embracing agile to best meet their business needs—and successfully manage projects, innovate, and prosper at astounding speed. Scott released Agile Scrum to provide those interested or involved in innovation, product development, project management, software development or technology management with a roadmap to implement Scrum, the most popular agile framework. It helps technical and non-technical teams deliver products in short cycles with rapid adaptation to change, fast time-to-market, and continuous improvement—which supports innovation and drives competitive advantage. Reactions to Agile Scrum have been incredibly positive. Earlier honors include 16 first place wins from national and international competitions: the 5th Annual Beverly Hills International Book Awards (for Business-General, and also for Technology), 2016 London Book Festival (for Business), Fall 2016 Pinnacle Book Achievement Awards (for Business), 2017 Feathered Quill Book Awards (for Informational), 2016 New Apple Book Awards (for Technology), 2017 Independent Press Award (for Technology), 11th Annual National Indie Excellence Awards (for Technology), 2017 Pacific Rim Book Festival (for Business), 2017 Bookvana Awards (for Green/Conscious Business), 2017 Book Excellence Awards (for Technology), 2017 Best Book Awards (for Business Reference), 2017 New York City Big Book Awards (for Technology), 2017 Royal Dragonfly Book Awards (for Science & Technology), 2017 Human Relations Indie Book Awards (for Workplace), and the 2018 Florida Book Festival (for Business). Scott M. Graffius, PMP, CSP, CSM, CSPO, ITIL, LSSGB is a project management expert, consultant, international speaker, and author. He founded and is CEO of Exceptional PPM and PMO Solutions, an Inc. Verified Business, which helps organizations better solve their problems and capitalize on opportunities via world-class project management related services. Results include more consistent realization of business outcomes, faster delivery speed, improved on-budget performance, higher satisfaction, and more. A fantastic agile transformation experience and result with a client in the entertainment industry was the inspiration for Scott's book, Agile Scrum. He is a former vice president of a provider of diverse consumer products and services over the Internet including social networking and internet access. Before that, Scott worked in organizations with businesses ranging from advanced technology products and services to business services, retail, e-commerce, manufacturing, and entertainment. He has experience with consumer, business, reseller, government, and international markets, as well as experience spanning 20 countries. Agile Scrum is offered in paperback and ebook formats at Amazon. The paperback is available in Canada, France, Germany, Italy, Spain, the United Kingdom, and the United States. The ebook is for sale in Australia, Brazil, Canada, France, Germany, India, Italy, Japan, Mexico, the Netherlands, Spain, the United Kingdom, and the United States. Specs are detailed at AgileScrumGuide.com. Review copies of Agile Scrum are available to members of broadcast, print or online media. Visit bit.ly/REVIEW-COPY. Visit AgileScrumGuide.com to learn more about the book. For information on the Pacific Book Review and their international awards program, visit pacificbookreview.com.